Buy Green City Mixed Spice - 27g in the UK from our online shop or directly from our independent Scottish store. Mixed Spice is used in baking, like Christmas cakes for example. One of the cheapest in town! Make this homemade tomato ketchup with the last of your homegrown tomatoes. You can either use green, red or a combination of the two. This recipe contains 1.5 tsp mixed spice. Typically served at celebratory meals in the Southern states of America, this pie links the classic combination of pumpkin, pecan nuts and aromatic warm spices in a pastry case. Serve warm as a dessert or chilled with a cup of coffee. This recipe contains 2 tsp mixed spice. A delightful Free From Christmas Cake! To make this recipe alcohol free, simply replace the sherry with fruit juice. Make this recipe vegan by using the alternative to egg and butter! This recipe contains 1 tsp mixed spice. As official Green City stockist, we sell genuine Herbs & Spices directly from our shop in Scotland and online throughout the UK. 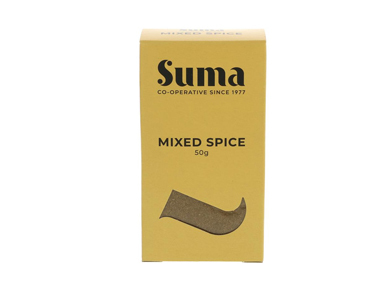 Where can you buy real Mixed Spice - 27g safely online? If you are wondering where you can buy Green City Mixed Spice - 27g safely online in the UK, then shop with us. We are an actual health foods shop; with real people selling real foods and products. Our award-winning independent shop is located in Stirling, Scotland since 1976. You can buy our Wholefoods and other genuine Herbs & Spices in store or safely place an order with us online or over the phone. Mixed Spice - 27g - Green City Mixed Spice - 27g in Herbs & Spices and Herbs, Spices & Salt.